* Gauge needle now pointing in a considerably more correct direction. V1.4 Has Bugs - NOW FIXED!!! This is a fantastic app. The major bugs disussed below were fixed by the developer only a day after they were reported. I appreciate their super-fast attention to this. Best speed testing app out there and also the prettiest interface IMHO. I love this app and have used it for a longtime. The most recentupdate has some obvious bugs that I can;t beleive they did not catch before releasingthis to the public. You used ot be abe to calibrate the dial so that….for example….if your connections are generally in the range of 0-100 mbps, you could set the top end of the dial to 100. Now it is set to 500 and there’s no way to change it. But the new “added feature” of this current release is that the indicater needle on the dial now points in the 180 degree opposite direction of the measurement. So if your speed is being measured as 30,the needle points to the exact other side of th dial and says soething like 400. If your speed is 95, the needle point back at like 0 or 5. How do software engineers let stuff out the door like this? I’m still rating this a 3 because I like this app so much, but these bugs need to be addressed FAST. Sorry about that. Odd one that didn't show up in the test build. We submitted an update with a fix, which should be available soon. Sorry again, and thanks for using Speedtest. Just notice that you had a Mac Desktop app!! 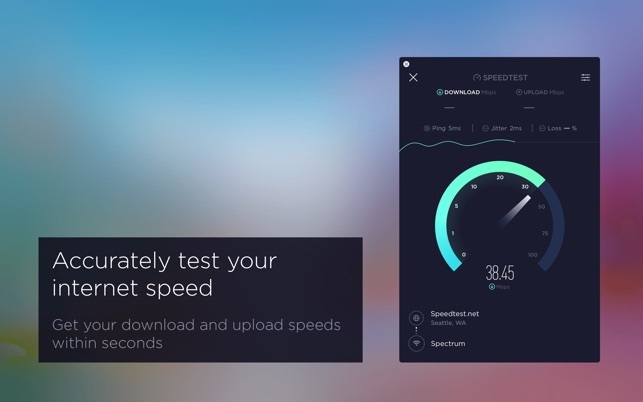 I have been a longtime Ookla Speedtest user for many moons…. I retired from IBM in 2008 with 30 years of working with computers/networks Speedtest has been my go to network test for as long as I can remember. I always found that depending on your web browser you could get different results and its far better to have a local run application to cut out as much of noise from applications to get a truer picture of what your results are. This app is well put together and the options it gives you are just what is needed with no extra fluff. The response is quick and the reporting is reliable, free from all the overhead of the browser and any cache etc that can and would be in the way. You still have the option of selecting where you want to test to. If is set automaticly to the closest point from you ISP. The graphical interface showing in a line graph of both incoming and outgoing testing shows how smooth or dirty you results can be. With showing a more flatline giving you the cleaner results of your ISP. I was just scrolling the top free apps on the mac app store and saw this. I use SpeedTest anytime I want to see the status of my connection but didn’t know it was an app. I’ll be honest my first thought was, why is this an app if I can just open safari and click on it in my bookbark bar? Then I downloaded the app and realized it was more responsive and gives an alert when the test is complete. Also now that I think about it the history of your speeds should be stored permanetly as long as the app exists on a computer. This is an advantage over safari because if you clear cache, cookies, and history, this connection speed data I’m pretty sure is also deleted. Overall, beautful design, awesome color scheme, smooth ainmations, and time tested functionality. P.S. It can be put in the menu bar! Hi there! We appreciate the positive feedback and are glad to hear you've been enjoying our desktop app. Thanks for being a loyal Speedtest user!